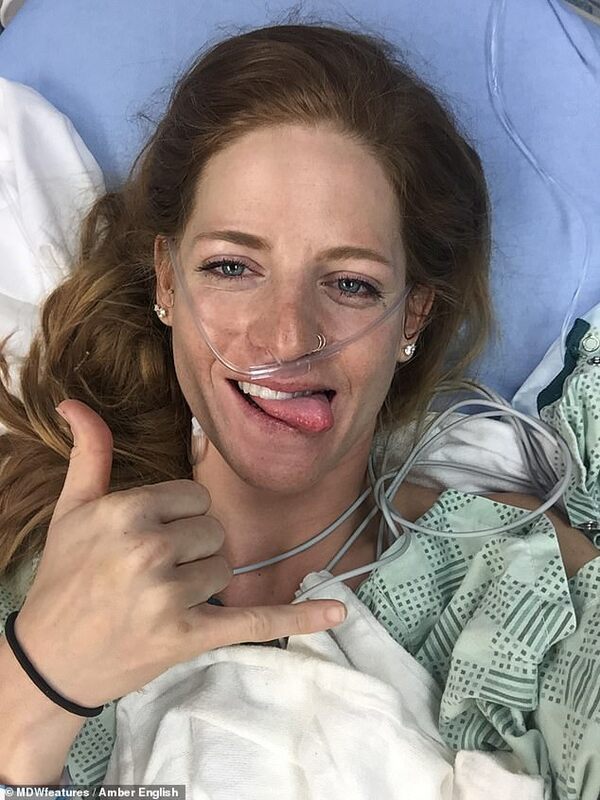 A snowboarder had to have her entire pelvis rebuilt after she smashed it when she hit a tree at 55mph. 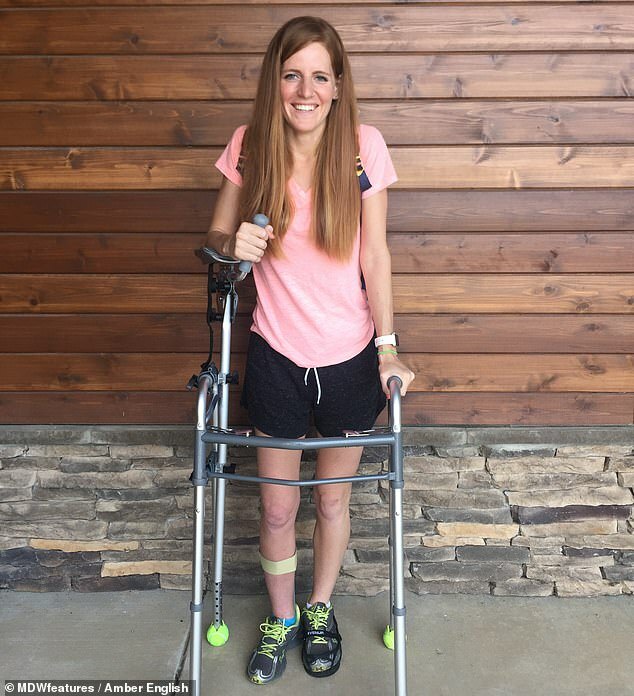 Amber English, from Missouri, needed a 12-hour operation after her devastating accident in March last year. She said doctors could find ‘no comparison’ for her injuries, which also triggered internal bleeding. 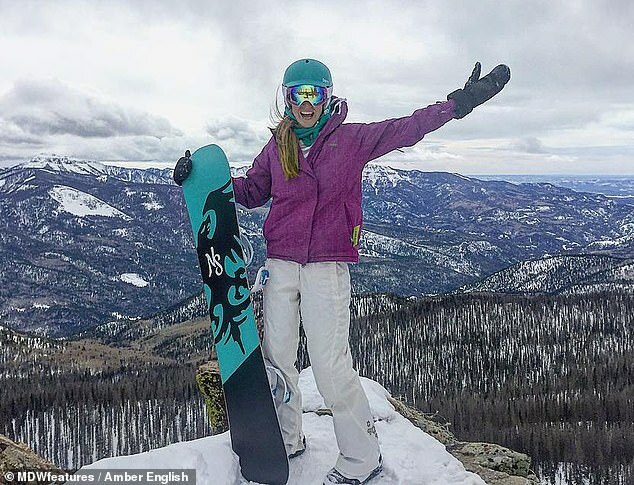 Intense rehab for months afterwards has meant Miss English has been able to return to snowboarding and her doctors praised her ‘miracle’ recovery. ‘High on adrenaline, I threw caution to the wind,’ said Miss English, who was staying in Colorado at the time. ‘It was my second run through that day. 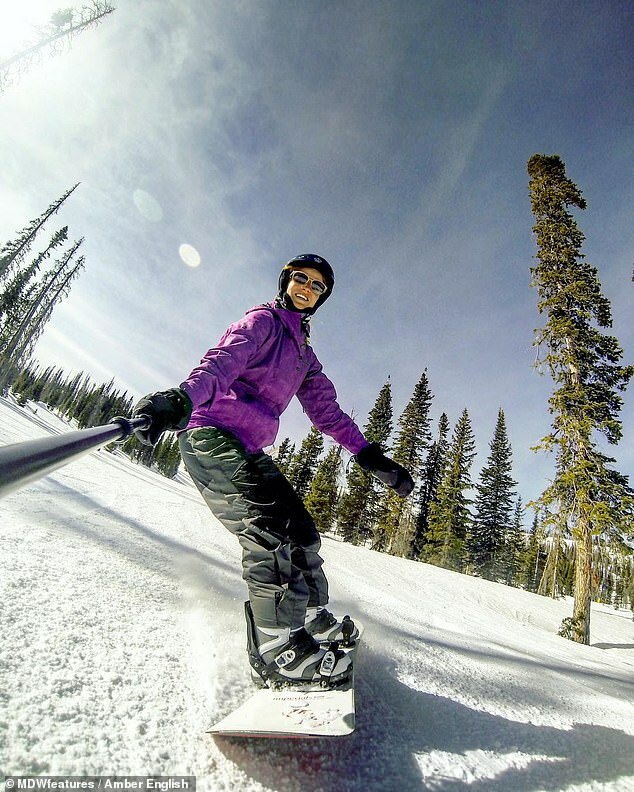 ‘I was having so much fun, so I just gave it all I had and went for the best run of my life. ‘As I was flying through the trees, I realised I was going too fast and the trees were getting tight. I freaked out and it all happened so fast. Miss English said she got wedged standing up between some trees, despite having broken her pelvis in multiple places. She thought she had been travelling at 30mph but doctors said the extent of the damage looked more like she was going 55mph. ‘I didn’t have the strength to remain standing and had no other option,’ she said. 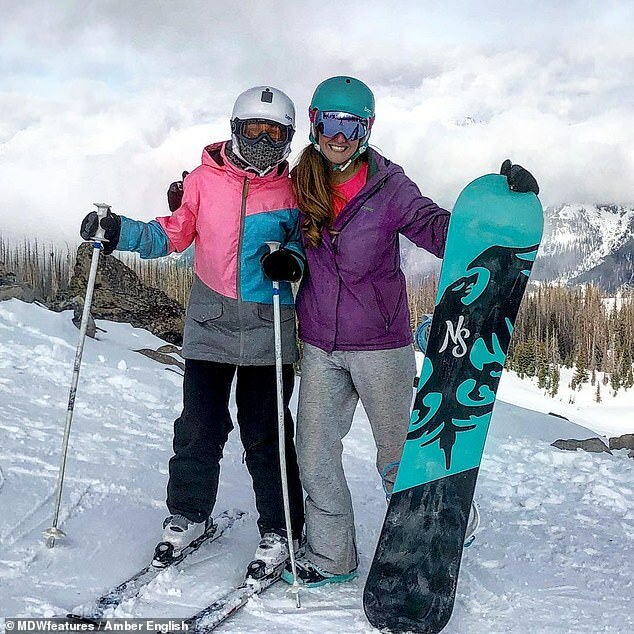 ‘I was in a lot of pain for a long time that day but lowering myself to the ground while still strapped to my snowboard was almost unbearable. 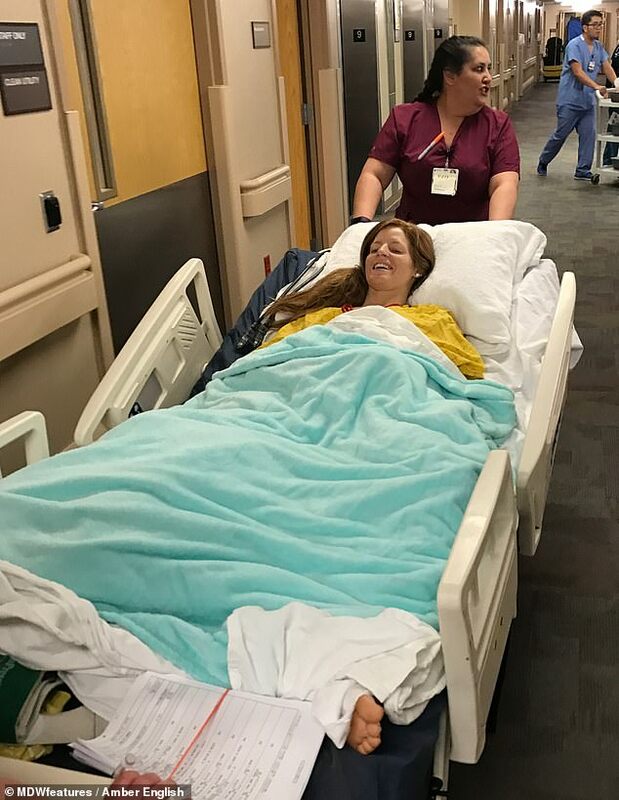 It took Miss English around an hour to make it to an ambulance – she had to be transported off the mountain in a sled without pain medication. When back at the hospital, a CAT scan revealed the extent of the damage she had done, and she said her doctor’s face ‘turned white’. ‘In the simplest of terms, I crushed my pelvis. My medical reports are filled with severe fractures of every feature in my right pelvis and internal bleeding. 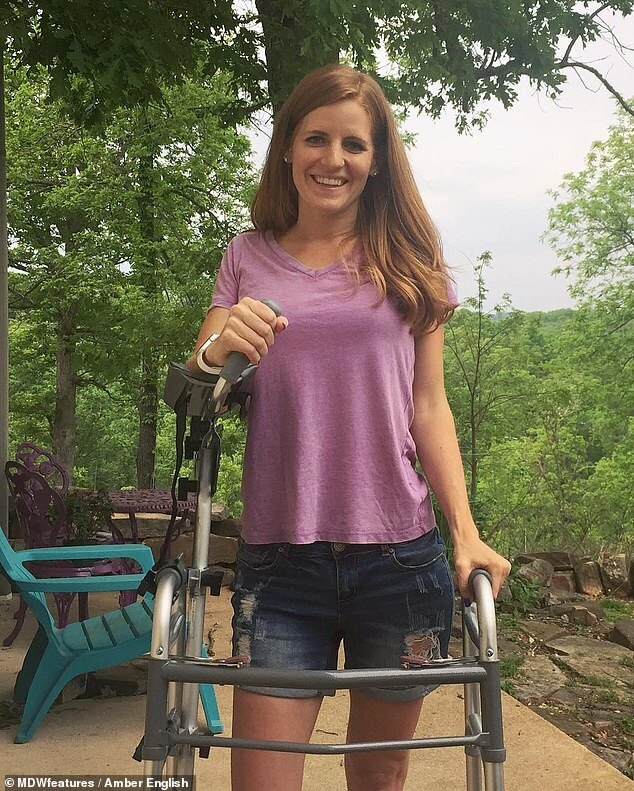 Miss English describes herself as a walking miracle after doctors said her case was one of the top five worst they had seen. What had been planned as a six-hour operation to rebuild her entire pelvis ended up taking twice as long because her bones were so damaged. After the operation Miss English had to relearn to walk with two weeks of inpatient rehab in hospital and a further eight months after she was discharged. She said: ‘My doctor later informed me that, out of the thousands of pelvic rebuilds he has constructed, mine was the top five worst he had ever seen. ‘I’m a walking miracle, but it hasn’t been easy. Rehab in the hospital was hard. ‘Relearning how to do everything was hard. But the entire time I couldn’t help but feel immensely blessed. ‘I still do physical therapy exercise to improve nerve and muscular damage and maintain range of motion. ‘I worked so hard to get back on the mountain by the next season and I did just that. HOW ARE PELVIS INJURIES FIXED? External fixation: In this operation, metal pins or screws are inserted into the bones through small incisions into the skin and muscle. 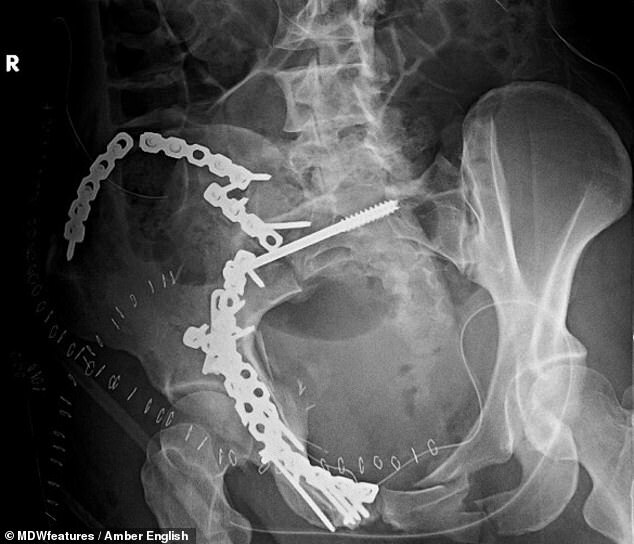 The pins and screws project out of the skin on both sides of the pelvis where they are attached to carbon fiber bars outside the skin. The external fixator acts as a stabilizing frame to hold the broken bones in proper position. In some cases, an external fixator is used to stabilize the bones until healing is complete. Skeletal traction: Skeletal traction is a pulley system of weights and counterweights that helps realign the pieces of bone. Skeletal traction is often used immediately after an injury and removed after surgery. Open reduction and internal fixation: During this operation, the displaced bone fragments are first repositioned (reduced) into their normal alignment. They are then held together with screws or metal plates attached to the outer surface of the bone. Nonsurgical treatment for stable fractures – in which the bones are nondisplaced or minimally displaced – include walking aids and medication to relive pain or reduce the risk of blood clots forming in legs and pelvis.